Empress Mumtaz Mahal has rightly been called the vigor of Shahjahan's life, and the inspiration behind his greatest creation, the Taj Mahal. She is portrayed here in her most usual and widely accepted physiognomy and attire. Opinions vary as to her real likeness in absence of an authentic version of her person. She has, however, invariably been portrayed in her contemporary and subsequent portraits as having an oval face, large forehead, prominent eyes, a well defined neck, thin composed lips, a slanting, sharp nose, a shapely turning chin made out of receding cheeks, long arms terminating in fine long fingers and, above all, her usual semi halo like type crown studded with large rubies, emeralds, diamonds and a few sapphires. A half-sleeved open jacket over her jama and the flower in her hand are other distinguishing features. The artist has further added to her personality the element of service by rendering in her hand a fan to suggest that the supreme lady of the empire was to her husband but a humble servant, always in service. 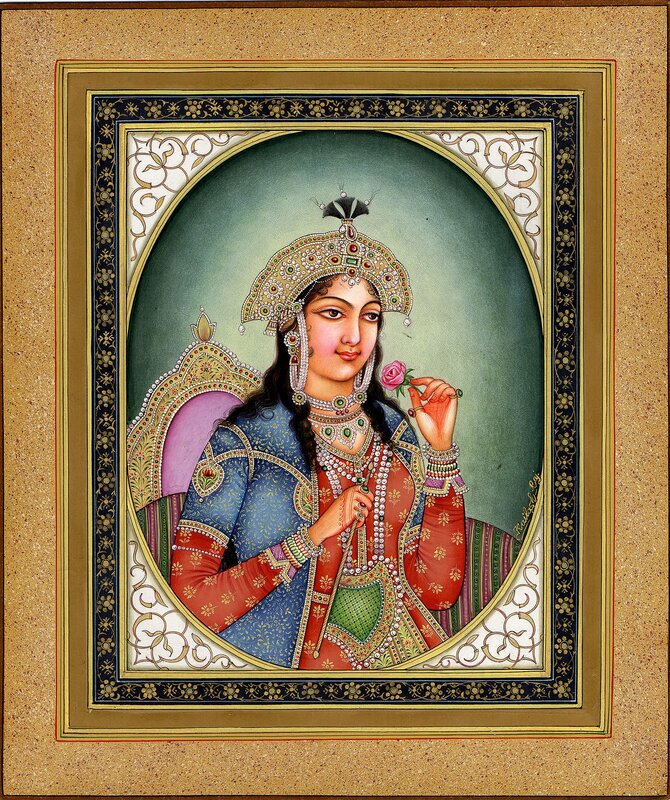 Mumtaz Mahal, or Arjumand Banu Begum, was born to Asaf Khan, brother of Empress NurJahan, who was a Mughal officer of high rank and the prime instrument behind the installation of Shahjahan on the Mughal throne. When eighteen, Mumtaz was married to Shahjahan, in the year 1612. This was just an year after her maternal aunt NurJahan was married to Emperor Jahangir, Shahjahan's father. Instigated by his grandfather Akbar, and assisted by several Mughal nobles, Shahajahan had been incessantly rebelling against his father, and was hence constantly on the run. Mumtaz Mahal, his beloved wife and the mother of his fourteen children, was during these adverse days his strength and his constant companion. 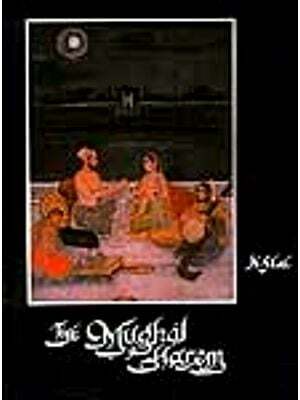 Mumtaz Mahal passed away at Burhanpur, in 1631, while giving birth to a child. She was cremated there, and only when the Taj Mahal was completed were her mortal remains shifted there. Dr. Daljeet is Curator, National Mueseum of india, New Delhi. hey why in the world are ya\'ll so rude to each other!!!! Wasn't she a Persian Princess??? SHE WAS A HINDU WOMAN WHO GOT CONVERTED TO ISLAM BECAUSE SHE LOVED A MUSLIM MAN SHE IS BURRIED IN TAJ MAHAL LEARN YOUR HISTORY AND BY THR WAY TAJ MAHAL IS NOT NAMED AFTER MUMTAJ IT IS JUST TAJ WHICH MEANS OF KING OR ROYALTY, TAJ REPESENTS CROWN AND CROWN IS ROYALTY OR KINGLY IN NATURE, GO TO SCHOOL AND LEARN SOMETHINGS. no she didn't get cremated you idiot, Muslims don't cremate and even if she did, there is a coffin there...explain that moron. she got cremated in India! she HAD to be cremated duhhhh! This article says that Mumtaz was cremated. That cannot be true! Muslims don't cremate! Outstanding and very exquisite! Great artistry! A must see.